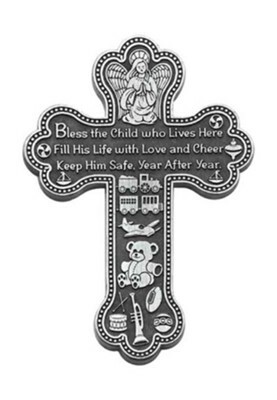 Wall cross of solid metal with bright finish features sentiment inscribed with detailed border and accents. 5.5" tall with knotch on back for hanging; gift boxed. Bless the child who lives here, fill his life with love and cheer, keep him sage, year after year. I'm the author/artist and I want to review Bless The Child Who Lives Here, Boy, Wall Cross.